With the help of our sound infrastructure, we offer a wide range of petroleum testing equipments to our clients all across the globe. All the equipments are made as per IS, BS & ASTM standards that provide them superior quality and high level of accuracy. We also conduct stringent quality checks on our manufactured range to ensure that our products provide flawless results and performance for a longer time period at clients end. 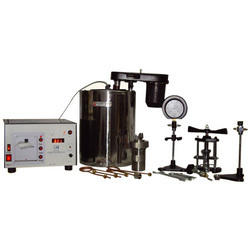 The extensive range of Digital Bomb Calorimeter offered by us is provided with printer, which is used for the determination of calorific value of liquid and solid. These are designed in compliance with the specifications of the Institute of Petroleum and the British Standard Institution. To ensure that the range we offer is of optimum quality, these are provided with test certificates i.e. digital beckmann thermometer & hydraulic pressure test. 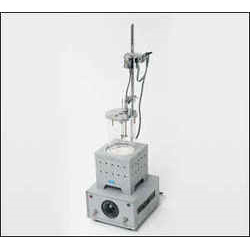 Used for determination of open Flash Point Tester and fire point of petroleum products except when the Cleveland apparatus is specified. 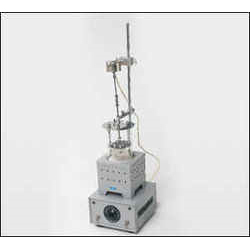 The same apparatus as above is used. Only the cup cover is replaced by an open clip. Fully Automatic Flash and Fire point apparatus. Ignition Source: Gas Flame with two Pilot electric Coil. Temperature Sensor: PT-100 in stainless steel sheath. Flash/Fire Detector: Ionization principle based flash-detector sensor. It is with PC Interface for data storing. We are a leading Name in Supplying of Pensky Martens Flash Point Tester. 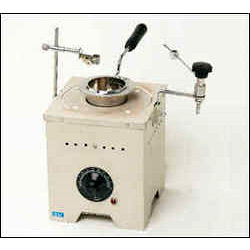 These are used for determination of flash point of petroleum products having a flash point above 49oc (120of. ) 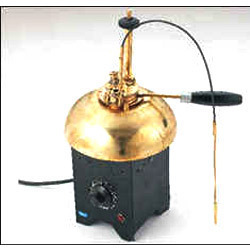 the apparatus consists of a cast iron stove fitted with a polished brass cover, a brass cup with cover which contains the test flame arrangement. , stirrer (hand operated) and a heating arrangement. For electrically heated model a rectangular heater with an energy regulator fitted in a box. We are a leading Supplier of Softening Point Apparatus. The apparatus consists of a stand in which two or four rings of specified dimensions may be placed. The rings are filled with bitumen on a base plate and balls of specified weight and dimensions are placed on the solidified material through guides. The whole assembly is placed inside a 600c.c. beaker with a hand stirrer. A suitable thermometer is used to note down the temperature of melting. Heating of bath can be done by an and electric heater controlled by an energy regulator stirring is done by motorized stirrer. We are leading manufacturer of Dropping Point Apparatus.There are two types of apparatus depending upon the type of cup used, in each case the apparatus consists of one beaker, a test tube, a stirrer, thermometers, a metal cup or a cup assembly. In method ip 37, the thermometer is fixed to cup assembly. Heating of the bath may be done by an electric heater controlled by an energy regulator and the stirring may be done by a motorized stirrer. Hand operated apparatus may be heated by one gas burner. Looking for Petroleum Testing Equipments ?